What part of (f(x)-f(a))/(x-a) don’t you understand? This involves four clearly-defined steps. (1) Compute all the function values in the numerator. (2) Perform the subtraction between the two objects in the numerator and simplify. (3) Factor the result out completely, and (4) see if you can find a common factor to cancel. And there’s a step (5): Since you know that every time you’ve done or seen a problem like this, there’s a factor/cancel step at the end, you know you screwed up if there isn’t one. But somehow, the fact that this is a totally algorithmic, almost automatic process that is the same procedure every single time — and even the slight variations among instances only consist in algebra tricks — doesn’t stop students from suffering a complete brain-freeze at the sight of them. They convince themselves they don’t know how or where to start (despite worked-out examples or even difference quotient exercises that they themselves have worked out before). They plug in to f. They use instead of . And so on. There’s a massive wall of intimidation that these exercises lay down, and even those who make it over that wall end up talking themselves into doing all kinds of stuff that is wrong bordering on bizarre. These exercises get inside their heads somehow. And these are young men and women smart and capable enough of getting into college, mind you — not dummies. The cure for math intimidation is a disciplined heuristic for solving problems and a faith in your algorithms for more mechanical exercises. 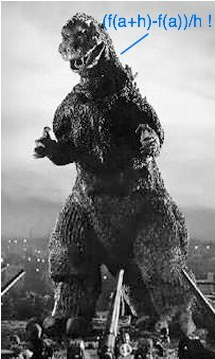 But with difference quotients somehow the heuristics and algorithms run fleeing like Tokyo residents before Godzilla. It’s not just difference quotients, either — there are lots of algebra components that throw calculus students for an absolute loop, and I cannot figure out why. Any ideas? I think maybe you hit on part of the answer in your explanation. Is differentiationreally “a totally algorithmic, almost automatic process that is the same procedure every single time”, or is it…slope/rate-finding? I understand that it’s taught initially as the former, but it has a deeper meaning that is closer to the latter (and beyond). One reason a student might write f(a) +h in the numerator, I imagine, is that they’ve been taught this – like you say – as an algorithm of symbol-manipulation without fully understanding the meaning of all the symbols or manipulations. In that context it’s quite easy to miss the important distinction between f(a+h) and f(a)+h…after all, same symbols, just different order. How could it make that much difference? I believe that for me there was an initial awkwardness-stage with these concepts until I really got it regarding what differentiation was really all about. And of course once I did, the quotient & method seemed laughably trivial. So I think a lot of students are in that position, of having to do differentiation before “getting it”, and that explains the difficulty. By the way I’m not saying I know how to solve this thorny issue. I don’t necessarily know a superior way to teach differentiation than how it already tends to be taught. I can think of many reasons why it might be necessary to teach the ‘algorithm’ before providing sufficient time for the ‘getting it’. But as long as we do the difficulty will be there, I suspect. Keep in mind that I’m not talking about taking limits here — jsut forming and simplifying the difference quotient. When you throw on limits that adds several new layers of complication. I think there’s some conceptual reasoning that has to take place, like the meaning of f(whatever), but it seems to me that there’s far more of mechanical calculation than there is deeper conceptual understanding required for this sort of thing. Right. My point is just that a memorized mechanical calculation is far easier to forget/flub if you haven’t internalized the meaning behind what you’re doing. And (rightly or wrongly) most students have to do the former before the latter. It’s actually far easier to remember mechanical calculations if you know their meaning because the meaning becomes a shorthand for the calculations, encodes them. Of course, one formula was about radiation shielding (how much radiation gets through a wall) and another was about radiation decay (how much activity remains after a given time), or something like that. I couldn’t believe he was devoting brainspace to memorizing these things since they each just boiled down to “exponential”, but memorize he did, right down to the letters for the parameters that were to be used in the formulas. This is a lot of work. It is also (relatedly) easy to screw up, I imagine, because if you didn’t memorize “exponential” how easy it might be to write Y=A * exp(-D)x. That’s why doing things this way makes me shudder. That’s a bunch of symbols, f’s, x’s, h’s to get all in the right place. How much easier and robust it would be just to memorize “take a slope” and then work out the required divided-difference from there. And now they are together and strange. I found her shock amusing and she found my lack of shock surprising. Of course, my experience tells me that with some students, you could spend months and still not get satisfactory results…. I think the problem is not understanding function notation. Too often students do not see this early in their algebraic careers and never fully understand it. To many f(x) + a is the same as f(x + a). There are things we can do in Algebra I to help prepare the way… I’m trying! In my experience, it’s usually because too many calculus students know almost no algebra.